REMEMBRANCE OF THINGS TO COME, the latest "cine-essay" of Chris Marker, is dense and demanding, a splendid reminder that his nimble, capacious mind has lost none of its agility, poetry, and power. 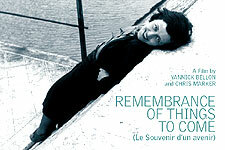 Ostensibly a portrait of photographer Denise Bellon, focusing on the two decades between 1935 and 1955, the film leaps and backtracks, Marker-style, from subject to subject, from a family portrait of Bellon and her two daughters, Loleh and Yannick (the latter co-authored the film), to a wide-ranging history of surrealism, of the city of Paris, of French cinema and the birth of the cinémathèque, of Europe, the National Front, the Second World War and Spanish Civil War, and postwar politics and culture. Full of Marker jokes (a great one about artists and cats), word play (Citroen/citron), filmic homages (Musidora makes a memorable appearance), peculiar art history, a consideration of the 1952 Olympics, and astounding segues from French colonialism in Africa to women in the Maghreb, to a Jewish wedding and gypsy culture in Europe, to Mein Kampf and the Nazi death camps (Birkenau, Auschwitz), the film opens with Dali and ends with Mompou, traversing in its short time a world of thought, feeling, and history. August Sander: A portrait of one of the most important photographers of the 20th century, who though uncelebrated in his own lifetime, pioneered social documentary photography. Colette: A fascinating visit with the legendary writer in her Paris apartment on the Palais Royal circa 1951. 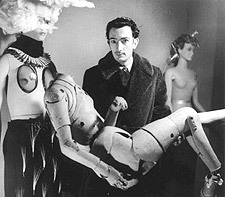 And Jean Cocteau drops by.